When life gets messy, hard, or lonely we tend to go through “religious change.” When our original religious views and “God box” no longer help us feel better, we decide it makes sense to open the box a bit and look around. As soon as we find a group of people who make us feel better again, we quickly “box them up” again. “Wow, I was so silly to believe X and Y, but now I believe A and B. You should believe A and B too.” For many people “enlightenment” is simply moving from one God box to a different one. 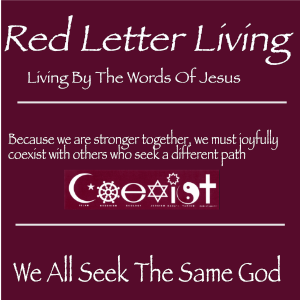 SOURCE: Yaholo Hoyt: Putting God in a Box to Keep People Out | Red Letter Christians. I kind of think that God is much bigger and inclusive than any box we might use in his name. Jesus was not about excluding the “bad” people but instead about welcoming all. Maybe we should try to do the same? Do Christians do anything good? I mean Christians who go to an established Church or follow an established religion? Janette, let me do what Jesus often did and answer your question with a question. Just because some Christians do much good and most Christians do some good, does that mean that we should quit trying to learn where we can follow Jesus even more closely? Contrary to some (maybe many), I don’t believe that Christianity is a “something for nothing” religion. We don’t just say the right words and then, with our fire insurance in hand, lay back and wait to die. Christianity is about “doing” MORE as each day passes and learning MORE about where we need to throw some of the things we do away and adopt others. The above lesson is along that line. We could spend our time patting each other on the back because we are members of a church but I don’t think that is what Jesus wants us to do. I think this paradigm applies to most (major) religions. It all relates to our established tribalism and provincialism, which in many ways actually is “organized ignorance”. We may have come a long way in terms of technology, but too much of the world are merely Cro Magnons with computers. Hi Steve. Thanks for your input. Thanks for pointing out that this applies to most of the world’s religions. I don’t think even the article above indicated that it was unique to Christianity.